These Baby Booties Will Quack You Up! Did you ever think about having duck feet? 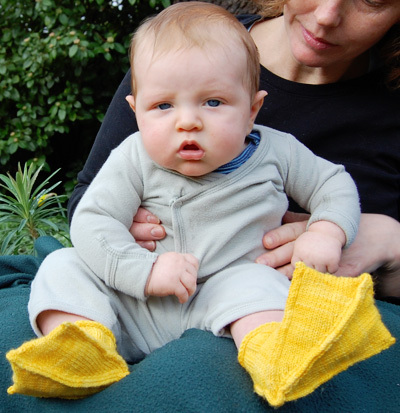 Now you can outfit your baby with them with this cute Duck knitting pattern. When Jeny Staiman had a baby she began knitting little booties for her. One day she realized that the functional constraints of these patterns didn't apply to someone who wasn't walking yet. It opened up a whole world of creativity for her. After reviewing the book Cute Knits for Baby Feet by Sue Whiting (available from Amazon.com), Jeny came up with her own more outrageous pattern for giving her daughter duck feet. These Duck baby booties will quack you up! If you would like you baby to go a bit "daffy," then tend to your knitting. For free instructions on how to knit these darling booties, click here. Waddle you do without them? If you are not a knitter, these duck booties are not nearly as cute but a close second choice. They have a selection of adorable animal booties like dog paws here.